My little niece was having one of those moments when she needed a bit of reassurance. Love that my sister in law is a mom who is tuned in. 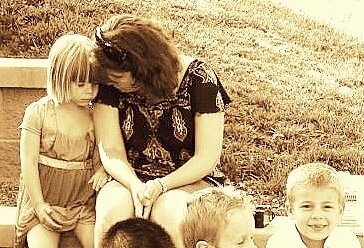 She listened and waited and comforted, and this little one was probably back to her normal sweet and spunky self in a short period of time! I love how love does that. It transforms. It’s not magical, but it’s so powerful. It’s not manipulative, just a sacrificial, getting in there, being there, and saying “I’m so with you no matter what” kind of thing. The benefits, the applications of the impact love makes? They are limitless, boundless, beyond measure. Love is a power to empower, and the effects are exponential. In Mark 12: 28-32, Jesus talks about the greatest two commands. The first is to love God, second is to love neighbor as you love yourself.What has greater transforming power than the Love of God? Not much I’d say. But it’s amazing how love fleshed out through us in everyday simple acts has incredible far reaching consequences that we’ll never even see! Today, I’ll look for those simple little opportunities to love well in the midst of a very busy world. I love what Mother Teresa said. “I may never do great things. But I can do small things with great love.” Hmmm. Simple acts and one profound truth with far-reaching effects…She had a bit of an impact, I’d say! Would that we would all become more intentional about doing the little things for those around us, because, bottom line, they are indeed the big things with greater impact than we could know. Moments matter, and one moment in time, handled with a little grace and love, can make all the difference.